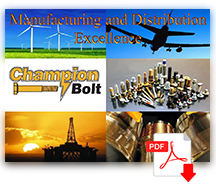 Custom Solutions - Champion Bolt, Inc.
Champion Bolt can provide virtually any fastener-related product you need. But we can also modify items in-house – whether it’s grinding, drilling, balancing or per drawing – these steps in the process never leave our watchful eyes. Typically our customers send us drawings of what they need, and we will quote them a price… a price kept reasonable by our ability to do the work ourselves. Our ability to customize boxes and labels will also help streamline things on your end. We will make customer-specific labels with all pertinent information (with other suppliers all you get is a packing slip). We will even send it straight to your customer with your logo on the package. Whatever it is you need, we can do it. One piece per bag? No problem. In effect, we are your partner, working behind the scenes to help you come through for your customers. If you have a custom solution that you need assistance with, please call us at 814.454.2721 or contact us online.